SigmaScan Pro’s comprehensive list of image types ensures image compatibility- including up to 16-bit grayscale images. You can convert images to different types, paste or splice images from one type to another, or modify pixel resolution while maintaining the aspect ration of the image. The powerful Histogram Stretch option lets you sharpen the contrast of color or grayscale images. Other enhancement techniques allow you to correct background lighting effects, apply color templates to grayscale images for highlighting hidden features or employ mathematical filters to add, remove, erode or dilate objects on an image. Plus, SigmaScan Pro’s Image Math functions let you remove noise and highlight features by adding, subtracting or averaging the pixel intensities of different images. Select from a library of more than 50 powerful measurement options to convert images into analytical data. Separate, count and number up to 64,000 image objects using powerful built-in algorithms and collect the data in a convenient spreadsheet where object numbers correlate to spreadsheet row numbers. Five non-destructive overlay planes allow you to collect measurements such as intensity, hue, saturation, distance, perimeter, slope, angle, area, volume, and center of mass simultaneously. Powerful edge and line tracking tools allow you to quickly outline objects and collect running measurements, so you save time marking the desired items. Guarantee accuracy by calibrating distance, area and intensity values. Use built-in column statistics to organize data and develop solid conclusions. Automatically sort and classify your measurement results or eliminate unwanted objects from your data. Chose from 140 worksheet functions to transform your data, show important relationships using the plot function or export files to advanced graphing packages such as SigmaPlot. As a scientist, engineer or technician, you’re often faced with problems that are difficult to measure but easy to photograph. 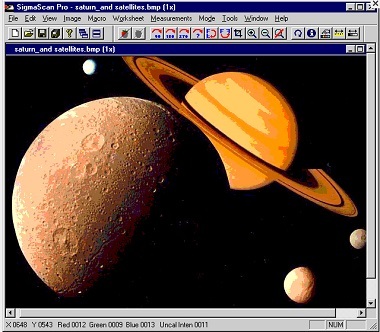 SigmaScan Pro provides a complete PC image solution for scientists — everything from image collection to data analysis. These powerful image analysis tools serve a multitude of scientific applications, including: optical microscopy, X-ray enhancement, cell counting and sorting, surface analysis, particle distribution, printed circuit board inspection, surface flaw detection and isolating typographic map features. And SigmaScan Pro offers complete compatibility; you can capture images from any TWAIN-supported device. You can open, modify and save common image files as such as BMP, JPEG, Mac PICT, PCX, TGA and TIFF. 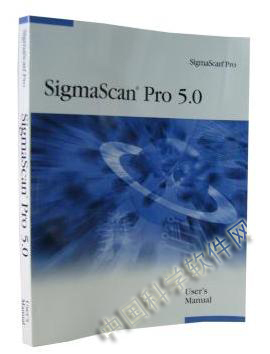 SigmaScan Pro is also compatible with many other file types you may encounter, including PhotoShop PSD, EPS and RAS. Plus, SigmaScan Pro’s easy-to use interface is designed specifically for scientists and technicians who don’t have the time or desire to become imaging experts — helping you quickly gain the information you need from your images and saving you valuable research time. SigmaScan Pro’s sophisticated enhancement techniques improve image quality and remove unwanted features, optimizing the image to your specifications. A powerful library of more than 50 measurement options collects your results in a convenient Microsoft ? Excel spreadsheet format. Use built-in column statistics, classify your data or choose from 140 worksheet functions to develop meaningful conclusions. Best of all, beginners learn quickly through an intuitive interface. SigmaScan Pro also provides the power to create custom macros to automate repetitive tasks. Not a programmer? No problem. Record macros with the point and click macro recorder. Experienced users and programmers can apply the VB-based macro language to create custom interfaces or seamlessly link SigmaScan Pro to other applications, such as SigmaPlot. Use the macro language to create a custom user-interface, including dialog boxes and menu choices that help guide less experienced users through your application. Execute a series of steps once then apply the sequence to other images to effortlessly perform complex analyses and data manipulation. Or, use built-in macros as provided or modify them for automating tasks such as counting and measuring objects, or splicing images. Employ SigmaScan Pro’s Online Macro Language Reference, which provides a complete overview of all macro commands and their functions, to develop powerful macros that save valuable research time. Call on SigmaScan Pro’s functionality from external sources that have Visual Basic embedded, including Microsoft Word and Excel or custom software applications. For example, you can run a Visual Basic script in MS Word or Excel that calls on SigmaScan Pro to perform image analysis tasks. SigmaScan Pro’s OLE automation provides unlimited flexibility.